Powers/Abilities: Dragonfire was a skilled martial artist (specific style unknown). He had a number of weapons hidden about his person: his "sash" concealed a poisonous snake, his robes contained spiked balls, designed for throwing, and coated with a swift acting, burning poison; and he carried at least one knife. History: (HC#15/6) Dragonfire commanded a number of members of the Dragon Tong as the rowed a small boat into the Chinatown harbor, and began to unload a cargo of opium. Their activities were interrupted by the arrival of a police launch, but the Tong warriors made short work of the law enforcers. Hearing the sounds of battle, the vigilante Night Raven raced to the spot and leapt into the boat. While a Tong member tried to take down the crimefighter, Dragonfire raced out of the boat onto the jetty. Night Raven grabbed for him, but only succeeded in snatching the villain's sash, which came away in his hand. To Night Raven's amazement, the sash proved to contain a live snake, which coiled round his wrist and prepared to strike! (HC#16/6) While the vigilante struggled with the serpent, Dragonfire and his men boarded the police launch with the intent of using it to escape. One of the surviving policemen tried to stop them, aiming at Dragonfire and warning them to stop or he would shoot. Contemptuously the Tong leader ordered one of his men to block the bullets with his own body. While his man died protecting him, Dragonfire pulled two spiked balls from his costume and threw the poisoned spheres into the officer's chest; the cop doubled over and fell, dead or dying, into the murky harbor water. With only one of his men still alive, Dragonfire gunned the launch away from the jetty, contemplating the failure the night had become, and consoling himself that at least the vigilante who had interrupted them was now dead...just as Night Raven pulled himself out of the water and on to the boat. The crimefighter eliminated the last of Dragonfire's helpers, then wrestled with Dragonfire for control of the wheel. The launch swerved out of control and into a barge carrying oil, engulfing both vessels in a huge explosion. (HC#17/6) Seconds before the two vessels struck one another, Night Raven had wrestled Dragonfire over the side of the launch and into the water, where they struggled with one another. 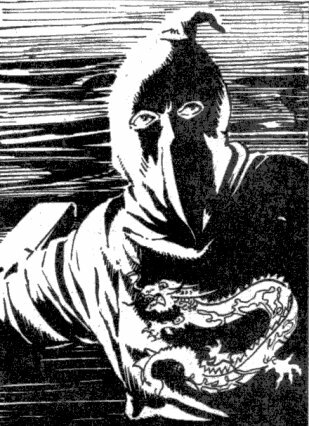 Dragonfire produced a knife, and as both men started to drown, the vigilante managed to kick himself away from his adversary. 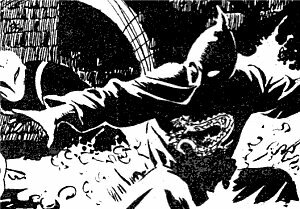 (HC#17/6, bts) Free of his opponent, Dragonfire entered the city's sewer system, presumably swept there by strong currents in a similar manner to Night Raven, who followed his passage seconds behind him. (HC#17/6) Dragonfire raced through the sewers, apparently unaware that Night Raven had surfaced from the waters behind him, and was hot on his tail. However as the vigilante approached a blind corner, Dragonfire stealthily waited in the shadows to ambush him. (HC#18/6) Dragonfire struck out as his opponent passed, but Night Raven, alerted by ripples in the water, ducked the first punch and threw his opponent over his shoulders. 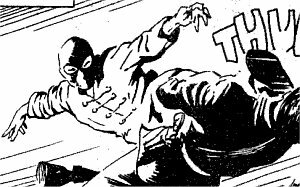 The agile Tong leader managed to land on his feet, and smashed the vigilante across the face with a powerful kick. Night Raven staggered back, coming into contact with the rungs of an exit ladder bolted into the wall; as Dragonfire raced forwards, Night Raven grabbed behind at the rungs, and swung both feet up into his enemy's head, stunning him. Realising he needed more space to deal with the agile criminal, the vigilante swiftly climbed the ladder, with Dragonfire close behind him. (HC#19/6) Dragonfire reached the top of the ladder, swearing to avenge his honor the next time he encountered Night Raven. However, as he slid the manhole cover aside, he discovered himself to be between the vigilante and Khan, Yi Yang's pet tiger. The beast launched itself at the interloper, who cried for Yi Yang's aid as it began to maul him. The pitiless supreme leader of the Dragon Tong replied that there were only two ways to stop a tiger attacking it's prey, either shoot the tiger, or shoot the prey; with those words she gunned Dragonfire down. He staggered back and fell through the open manhole, apparently falling to his death. Comments: Created by Steve Parkhouse and John Bolton. Night Raven seems to have heard or met Dragonfire before this encounter - he knows the villain's name at the start of the second installment, despite the fact that no one has said it aloud, while Dragonfire similarly mentions the vigilante's name at the start of the story in#19. 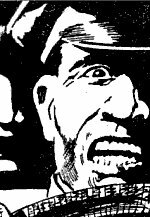 Much like the Republic serials which served as partial inspiration for Night Raven, the beginning of the third installment of the adventure described above goes back in time a few seconds to show how the hero (and villain) both managed to survive the cliffhanger ending of episode two. Dragonfire received a real name in Night Raven's profile in OHotMU A-Z HC#8. or to anyone else with Dragon as part of their name. A Chinese criminal society headed by Yi Yang and Dragonfire. The members were skilled in martial arts, carried metal throwing stars, and were blindly loyal, willing to die for their masters; the price for any failure was death. At least four accompanied Dragonfire on the smuggling mission: one was seemingly killed by Night Raven in the smuggler's boat, a second, Ling, interposed himself between Dragonfire and a police man's bullets; the third fought Night Raven on board the police launch, and presumably was either knocked overboard, or killed when the launch exploded; the final one made it back to base to inform Yi Yang of the mission's failure, and was executed by her.Yi Yang ordered all available men out onto the streets to hunt the interfering vigilante down - unfortunately for the ones who found him, Night Raven was more than a match for them. Yi Yang's chauffeur, who drove her and Khan around the city. While trying to shake Night Raven off the roof of the car, he drove the vehicle into a dead end, and was killed in the subsequent crash. Yi Yang's pet tiger. 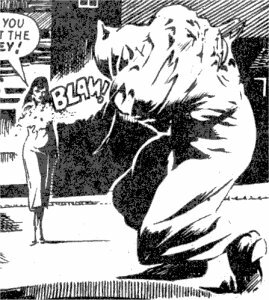 She unleashed it on Night Raven after he easily defeated her Tong assassins. Dragonfire unintentionally got between the beast and it's prey, and was mauled for his mistake. It somehow followed the fleeing Night Raven up the side of the Ravenscourt Building, where it confronted him on a high ledge. 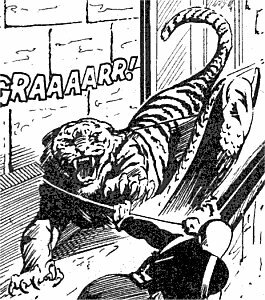 As Khan lunged, the hero dodged, and the tiger fell, probably to its death. All other characters mentioned or pictured are  and © 1941-2099 Marvel Characters, Inc. All Rights Reserved. If you like this stuff, you should check out the real thing!